Description: Cci/Speer 56 SUB-SONIC HP AMMO 22 LONG RIFLE 40GR LEAD HOLLOW POINT Small moving targets makes shooting more challenging, rely on your ammunition to do the work. Whether you're harvesting for their hide or the kitchen table, clean holes and minimal meat damage is important. CCI? understands the needs of hunters and has designed ammunition with the small game hunter in mind. 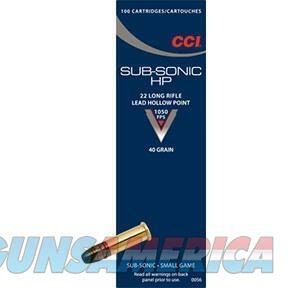 No matter your needs, CCI has tough bullets for great penetration. Look for CCI's small game lineup to find the caliber and load that match your needs. Keep meat spoilage or hide damage to a minimum; choose CCI when you're heading out to the field or the range.